As far as confectionery goes I tend to view Hershey (NYSE: HSY) in a similar way to Coca-Cola and PepsiCo in the soft-drinks industry, albeit on a less global, more domestic scale. It’s stable (we all love candy and chocolate after all), and generally speaking people tend to stick with the brands they know and have gotten to love over the years. Product quality obviously comes in to it, but mostly we’re talking about branding in individual markets and the ability to exhibit a degree of pricing power. As far as I can see there are three pure-play confectionery companies that are publicly listed: Hershey, Mondelez International and Swiss premium chocolatier Lindt & Sprüngli. Once you factor in the privately held companies such as Mars and Ferrero (of Ferrero Rocher fame), plus the food & beverage behemoth Nestlé, then you are looking at the lion’s share of the global confectionery market right there. I will be covering most of these stocks at some point, but first let’s take a deeper look at The Hershey Company. Hershey and Mars pretty much dominate the US confectionery market with about 30% market share each. Hershey’s investor fact guide puts them slightly ahead of Mars once you break it down into a more detailed look but for all intents and purposes I tend to see these two as pretty much equal in controlling the market. The great thing about candy is it all comes down to branding power. Everyone in North America knows about Hershey and has eaten a Hershey bar at some point in their life. I mean the company even call it the “The Great North American Chocolate Bar”. It just commands an enormous amount of branding power at home. Does anyone reading this honestly see names like Reese’s Peanut Butter Cups or Hershey’s Kisses disappearing anytime soon? Nope, me neither. What you also have to remember is that Hershey, Mars and indeed all the other individual companies like Nestlé and Lindt are pretty old in corporate terms. This is such an incredibly stable industry, relatively speaking, that the chance of any kind of new entrant or disruptive technology is almost impossible to imagine. You only have to check out the percentage change on the 2014 figures for market share to see how stable the market is. Year-on-year there is barely any movement in market share, and Hershey along with Mars have dominated it in the United States for the past several decades. There’s actually not much more to it than that really. The two most important things to remember here are the branding power and the economies of scale. The former is a source of constant demand for the products, whilst the latter means that any new entrant wishing to compete with them on price will get trampled in their dominant market. When it comes down to chocolate on its own, then Hershey’s leading position in the U.S. market is even more apparent: the company have a greater than 40% market share. Again it can’t be stressed enough that the whole industry is very stable – just check out how little the market share changes year-on-year. The point about having a stable, untouchable position in its sector is that it naturally shows up in terms of economic profits. Hershey generates extremely high returns on capital on a very consistent basis. It doesn’t require lots of reinvestment into the business, hence cash flow to capital expenditure is also usually at a very high ratio. It’s the same theme with all the great habitual consumer compounders like Coca-Cola, Colgate-Palmolive and Procter & Gamble and it’s precisely why they are great core portfolio holdings. At reasonable valuations, or just by using dollar cost averaging to smooth it all out, the chances are they will generate significant shareholder returns over a long enough time frame. Let’s assume an investor bought $10,000 worth of Hershey stock in June 1990 – around the time I was born. If we take into account the various stock splits then our investor would have been able to pick up a total of 1,062 shares at a price of $9.41 per share. Over the following twenty-five years they would’ve seen average compounded share price appreciation of over 9% per-year, meaning the initial $10,000 capital outlay would be worth almost $100,000 before taking into account dividends. Meanwhile those dividends kept on rolling in. 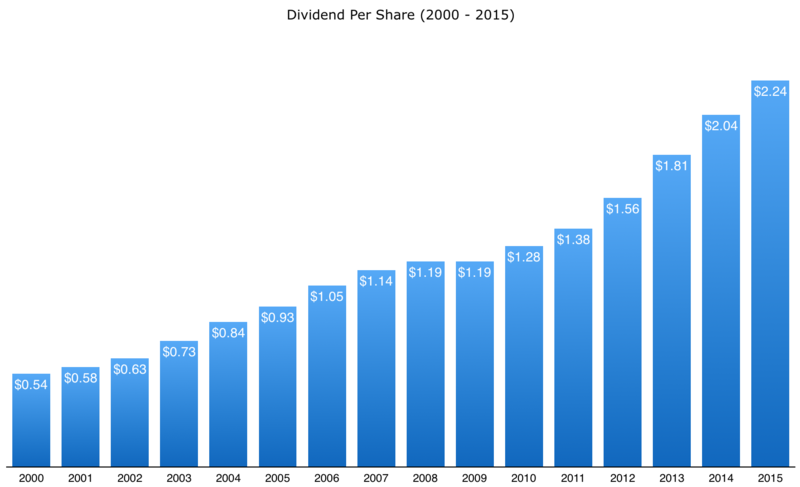 Back in 2000 the company paid out $0.54 per share in cash dividends to shareholders. Last year the distribution came out to $2.24 per share. In effect that’s 10% a year income growth for owning one of the stodgiest, high quality blue chip stocks on the market. Our investor from 1990 would see a yield on cost today equal to around 25% of the initial capital outlay. In other words every $10,000 spent on Hershey stock in 1990 will produce around $2,500 in current annual income. The great thing is that there really isn’t much else the company have left to do other than hand the buckets of cash they make back to shareholders. The fact that the company is controlled by The Hershey Trust just makes it better because their interests are pretty much directly aligned with long-term shareholders. It also affords a general degree of stability that you don’t get regularly with publicly listed stocks. The economic profits are so stable, and so far above the company’s cost of capital, that it will pay in the long run to hold assuming you get a reasonable price for your shares. If you’re confident on America’s long-term prospects, and confident Americans will continue to eat candy, then Hershey is rock solid. It won’t be going anywhere in a hurry that’s for sure.